Choosing between Persona 3 Dancing in Moonlight or Persona 5 Dancing in Starlight is mostly a matter of preference. Where Persona 5 brings the acid jazz, Persona 3 Dancing in Moonlight brings more of a funk, hip hop flair in terms of soundtrack, which is reflected in the tracks featured from the original game and also in the remixes based off its tracks. 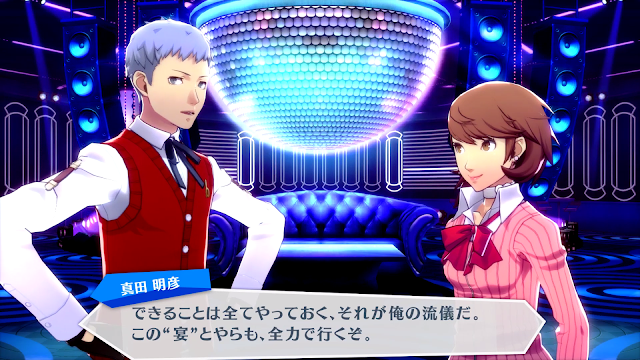 Dancing in Moonlight features the same polished rhythm game experience that Dancing in Starlight does, but with a Persona 3 makeover and its characters. Setting it apart is that Moonlight features the most high quality 3D models we’ve seen of Persona 3’s characters in years, so playing this game and seeing the updated versions of these characters felt special as someone who has played the original Persona 3 game as a PS2 classic. Whether you’re here for the dancing or here for more Persona 3, Persona 3 Dancing in Moonlight delivers the polished rhythm game and visual experience that fans of Persona’s Dancing games expect while being a great visual tribute to Persona 3 and its great characters in this rhythm game experience. 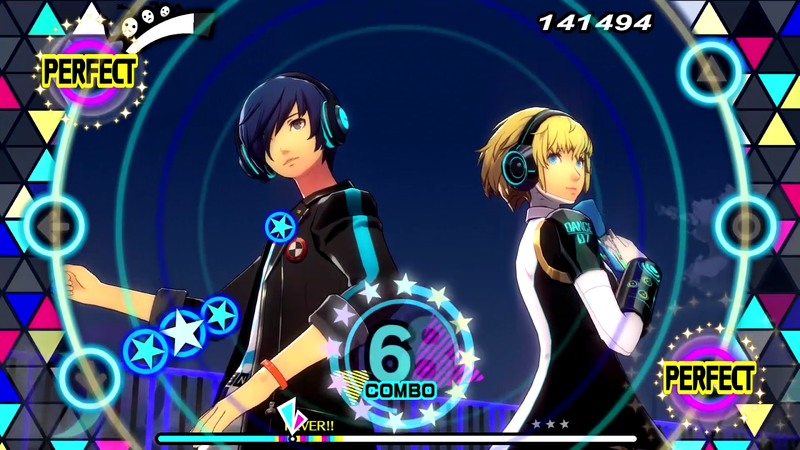 Persona 3 Dancing in Moonlight features the circular rhythm game system also found in both in Dancing All Night and Dancing in Starlight. 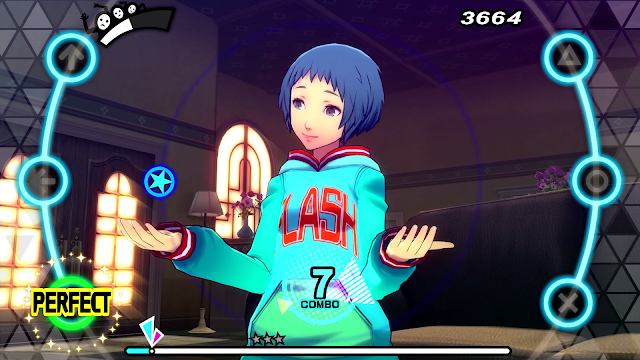 It features the same updates to this UI that Dancing in Starlight has: the UI is cleaner and makes it easier to focus on your gameplay with just your score and the Hype gauge up top, just with a Blue Persona 3 skin and colours. It might sound small, but one of my favourite parts of Dancing in Moonlight is its UI based on the original Persona 3 game both in the rhythm game and in its menus. Everything is a combination of Persona 3’s signature blue combined with the colourful elements featured in Persona Dance games and little touches like the hype bar being Shadows presumably from Tartarus (since Dancing in Starlight used the people of Mementos) are touches I appreciated as someone who has played Persona 3. As a nostalgic final touch, the menus in Dancing in Moonlight also felt like an updated version of Persona 3, particularly with its menu sounds and the layout of its social events using Tarot Card reminiscent of Persona 3’s social links. It’s these touches that make me feel like they put a lot of effort into making Dancing in Moonlight special for fans of Persona 3 and made me feel instantly at home in this rhythm game version of it. I said in my review of Persona 5 Dancing in Starlight that its characters looked the best they’ve ever looked and in Dancing in Moonlight for Persona 3’s characters, that is an understatement. Since Persona 3’s characters haven’t really been in 3D since it’s PS2 release, the graphics used in Dancing in Moonlight are a huge step up from how I remember the characters and it was a delight to see each character move smoothly and with more detail, both in their dances and in social events. Like in Dancing in Starlight, the characters also show their personality in dance and this was a subtle but nice reminder of what these characters are like since I haven’t played anything with Persona 3 in it for a while. Little touches like Junpei having a song that starts off with him dancing with his baseball bat or Akihiko’s boxing inspired dance style really made their personalities shine through and was a good representation of each character. On top of re-getting to know its characters were the reminders of its world through the cool sets based on Persona 3, with familiar places like the shopping mall, the dorms and a few places that are clearly in the Midnight Hour from Persona 3 having me itching for a Persona 3 remake thanks to how much care and detail was put into recreating these places. Despite how old Persona 3 is at this point, it’s great to see the care that was put into recreating its many designs for characters and places and makes Persona 3 Dancing in Moonlight feel like an extra special tribute to its source material. Dancing in Moonlight isn’t just a great visual tribute to Persona 3 as it also incorporates many songs and remixes based off music from its original game. It keeps Persona 3’s unique funk-infused hip hop in tact in its original tracks while also adding remixes that span from dance to heavy rock hip hop blends, complimenting the darker tone of Persona 3 well (there are some song previews in the video around 3:52). And for those who enjoyed Persona 3’s original soundtrack, like Dancing in Starlight it features a few rhythm game tracks that are unremixed tracks from the original game that were also enjoyable since Persona games generally have good soundtracks and Persona 3 is no exception. In this Persona Dance game though, I really enjoyed the remixes most with its blend of genres and am still waiting on that separate soundtrack release so I can listen to these songs when I’m not playing because they’re a great new take on an already great soundtrack. As a return to Persona 3’s characters after a while, Dancing in Moonlight’s social events follow the same structure of unlocking events with your rhythm game progress to get to know the characters more in small events like in Dancing in Starlight. These are unlocked with the same requirements too, with the amount of Perfects, Brilliants or Combo notes accumulated in songs being just some of the ways to unlock events and get to know characters more. Again since it’s been a while since I’ve played anything Persona 3 related, the character events reflected their personalities just as well as other Persona spin-off games have and there are a lot of humourous and insightful moments to help get to know these characters more and even after being in so many spin-off games, Persona 3’s cast still seems to have some new things to talk about. While unlocking things in the rhythm games to see these events may still be hit or miss to those just here for the story and not so much the rhythm game portion, as a fan of rhythm games I liked the way they encouraged me to play better or play differently and the social events were a nice reward for my hard work. With many unlockables like costumes, game modes and gameplay elements on top of unlocking its songs and social events, there’s plenty to keep you busy in Dancing in Moonlight. These are all unlocked pretty much the same way as in Dancing in Starlight, just with different characters, so if you’ve already played one of the rhythm games it becomes easier to work out how to get things in the other, which as expected made playing Dancing in Moonlight less challenging but also encouraged me to try use some of the gameplay challenges I was earning. With challenges like making songs harder to complete by making the Hype gauge fill up slower or by making the middle of the screen invisible, adding challenges like this allowed me to keep this rhythm game still feeling fresh and fun in its Moonlight version. Dancing in Moonlight also has more rooms to explore in some of its social events in its card-finding VR compatible mini-game, so it was fun to this time get to know Persona 3’s characters as I searched for well hidden cards in these detailed spaces. I’ve played 10 hours of Persona 3 Dancing in Moonlight so far and don’t plan on leaving Dancing in Moonlight or Starlight anytime soon as a fan of unlocking things and thanks to its many ways of customising the dance game, I’m glad I can keep these experiences fresh as I try to unlock everything. Persona 3 Dancing in Moonlight reintroduced me to its music and characters through its rhythm game and social events and reminded me of why this game also works well as a Persona Dance game. In its great original and remixed songs, its characters showing their personalities through dance breathe new life into an already great soundtrack and with its Persona 3-inspired UI, Dancing in Moonlight gives Persona 3 the current gen visual upgrade it deserves. With its detailed dances, sets and character models, I’ve left Dancing in Moonlight really seeing the potential for a great Persona 3 remake on PS4 because of how well they tributed the game in this spin-off. But for now, Persona 3 Dancing in Moonlight is a good way to revisit this part of the Persona series again and made me remember how good these characters are while introducing me to some great new remixes of its soundtrack in this enjoyable addition to the Persona Dance series. Still Dancing while wishing for a Persona 3 Remake with these gorgeous detailed sets. Special thanks to CorruptedSave for gifting this game to me (feel free to check out his YouTube Channel!)! Also special thanks to the people on Twitter who voted in the poll I put out asking if I should put song previews in the video! Be sure to follow me on Twitter if you wanna be able to vote in these kinds of polls too! You can pre-order Persona 3 Dancing in Moonlight in English at Play-Asia.com! 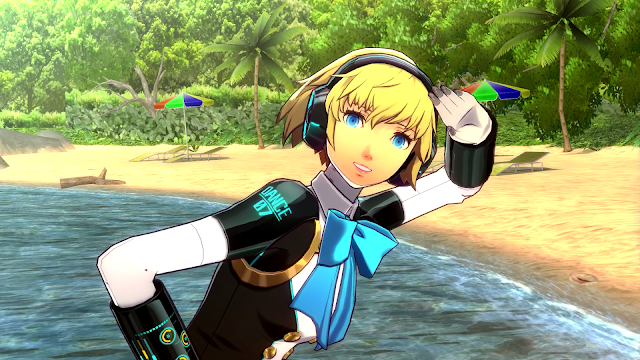 Will you try Persona 3 Dancing in Moonlight or Persona 5 Dancing in Starlight when they get localised? Are you a fan of the Persona Dance games?